Hi guys! 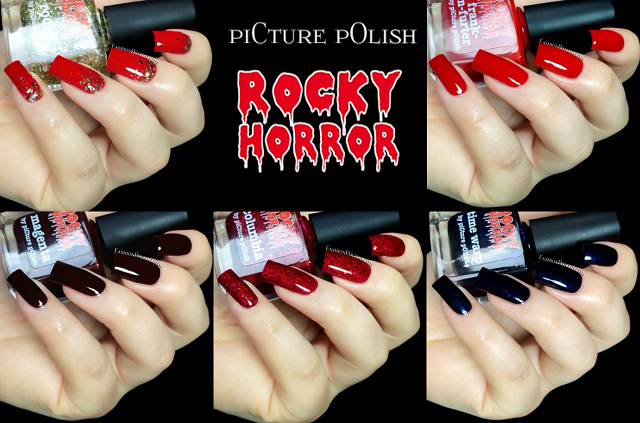 I have the brand new piCture pOlish Rocky Horror collection to show you today! Well, technically this collection wad released a little while ago in Australia and exclusively sold in the country on the Rocky Horror Picture Show tour but fortunately for us it is now becoming available to all nail enthusiasts worldwide! This collection consists of 5 nail polishes, 2 crellies, 2 glitters and 1 shimmer, all inspired by the famous musical. Frank-n-Furter is a bright red crelly inspired by "the very outrageous Frank-n-Furter and his red lips". A classic color but perfectly formulated and butter smooth. I used 2 coats plus topcoat. Rocky is a blingtastic glitter topper made of different sizes of gold hexes and inspired by "the very innocent Rocky and his golden hot pants". 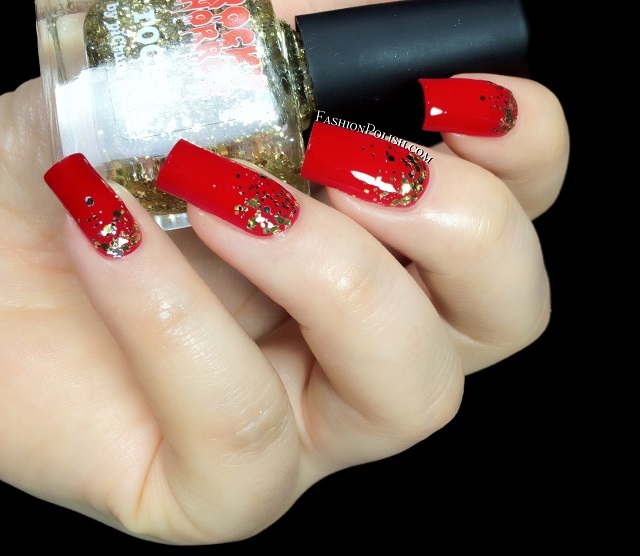 If you've tried piCture pOlish glitters before then you must know that they are really easy to work with. I used it over Frank-n-Furter below. Columbia is a heavy mix of red glitters in a ruby jelly base, inspired by "the very zany Columbia and her red bow tie". There's so much depth in this polish! It's the one I was the most excited about and and it ended up being my favorite, gotta love when that happens! Coats used : 2 plus topcoat. Magenta is a deep, vampy, chocolate crelly inspired by "the marvellous Magenta and her beautiful long locks". Formula was just as flawless as the rest, you're looking at 2 coats plus topcoat. Time Warp is a blackened navy shimmer inspired by "that unforgettable and fabulous tune... it's just a jump to the left and so on...". I can also see some sparse fuchsia shimmers in there, it's a really beautiful vampy blue. I also used 2 coats plus topcoat in my swatch below. The Rocky Horror collection will be available for purchase on April 14th on piCturepOlish.com.au and will retail for AU$14 each. Make sure to check the International Network Page to find out when/where to get them in your country.